Yes, cats can seem highly independent, even indifferent. But however solitary you think your cat may be, he definitely has ways of showing how much he loves and needs you. 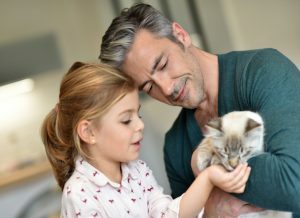 Look for these signs that your cat loves you and considers himself part of your family. Even it’s just for a moment, a forehead touch, or slight chin to forehead nuzzle, is a sign of trust and affection. The original intent of kneading comes from when cats are kittens and they use the behavior to stimulate the release of milk from the mother during nursing. As they grow, however, many cats keep up this behavior and it’s a sign of contentment. If your cat comes up to you with his tail hoisted in the air and the tip twitching back and forth, he’s actually showing you a sign of affection. While your cat may invite you to interact, he may also turn that play behavior into wildness or aggression, so be careful. One of the most common and well-known signs of love from your cat, purring is the ultimate sign of contentment. While in your presence, a purr from your feline friend means he’s more than happy to sit back, relax, and be spoiled by you. 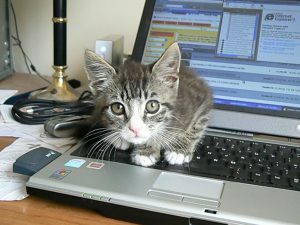 Whether it’s licking your hair while you sleep, or taking a casual stroll over your laptop while you work, such interruptions from your cat mean he wants to interact with you and is ready for some extra affection. 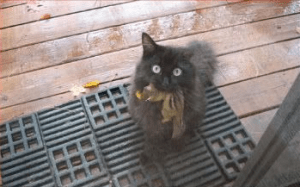 Though it can be a little gross when you’re presented with a dead mouse or bird, when your cat brings you this prized possession, he’s sharing his prey with you. Believe it or not, this is actually a true sign of kitty friendship. Lol—–my cat never brought me a dead bird or anything, but he definitely climb on my lap and purr and purr and stretch out his paws—it was so cute and comfortable,lol. I meant “climbed” on my lap,lol. Me and my bad spelling. My Max loves to groom my husband’s and my hair. my cat brought me a present from the “totally fenced in” back yard. I was so afraid he had killed something. he trotted up so proudly, raised his head as far back as he could and slammed it on the floor in front of me. it was a bird sized piece of tree bark. that was 4 years ago right after I took him from a shelter. I still have him and the bark. (-: his name is Tommy TwoTone. Michelle, don’t get discouraged. They may have confidence in knowing that you do love them already, and vice versa, and show others affection because they are seeking that additional attention. They know they have you. You can always try little things, too, like placing a blanket next to you or on your lap that has a bit of catnip on it or a toy or a treat…something they may already enjoy. Don’t force the situation, just place the item and leave it. It may take some time and patience, but you could also be quite surprised. Good luck! hi who writes the posts on here? My cat ruby when I first got her she would hiss at me but now she loves me and she had some kittens they were so cute but they were placed in new homes a couple of years ago I miss them. And my cat ruby was given away the same time her kittens were I miss her so much she was always there for me she was my friend and sometimes when I was sad ruby would come up too me and sit on my lap until I felt better.